Have you ever heard of Arte Povera? Have you ever wondered why it is not translated from Italian (it literally means “poor art”)? You will discover everything in the following paragraphs! The Arte Povera movement was born in Italy (you didn’t guess this, did you!) in 1967. Why do we have such a precise date? Because one of the most important art critics of the time, Germano Celant, invented the term in a critique he wrote. Of course some important works were created before this date, and everyone of them falls under the umbrella-term of Arte Povera. In Italy at the time the Minimal Art and the American Abstract Expressionism were very popular, but some artits were tired of those trends. As a reaction, they created something totally different, with the approval of the critique, since Germano Celant was holding their hands. Although the name of the movement is Arte Povera, they didn’t use “poor” materials, not only at least. They wanted to make a statement against the high-qualified art that uses only marble, oil paint and canvases, choosing to recycle materials, or using natural items to build their “assemblages”. This doesn’t mean that they avoided precious materials! They just included other ones in the process. One example is the Eating structure by Anselmo, that we are going to explain a couple of paragraphs below. The artists belonging to this movement wanted also to act against the art market (although everyone of them sold pieces to the art market eventually…). They thought that by using natural, and therefore perishable objects, their work could not be bought and sold. Obviously that was not true, otherwise we would not speak about them now! The idea is to be appreciated though. The idea of challenging the art market was already present in the Conceptual Art, the Performance Art, the Minimal Art and many others (but at the end they always found way of selling something). The artists of the Arte Povera considered their movement as the “guerrilla” against the big an powerful American art. The guerrilla is a militar strategy consisting of little, unexpected attacks, made by some individuals against an army to weaken it. Did they manage to defeat the enemy? Just tell us your opinion! The main idea of Germano Celant was to bring everything back to the essential, to everyday materials, taking out any idea that was superficial or influenced by the consumerism of the time. Does this ring a bell? Minimal Art! Every artist we will mention here is Italian, because the movement was very finite into the borders of Italy, although it had a very important influence on art globally. This is why the term “Arte Povera” is almost never translated. They are all Italian – I was saying – apart from one, Jannis Kounellis (you can recognize that he is not Italian by the last letter of his name and surname: they are not vowels, he is not Italian!). He was Greek by birth, but no one cared at the time, since he was living in Italy for many years already. If only this happened now with all the immigrants issues! He was probably the most important artist of the movement, the one who initiated it and the one who stack with it the most. He started the series of “igloos”, his typical shape made of different materials every time. The igloo shape had the function of reminding the connection the humans had with nature, because the igloo was (and in some places still is) the only way the humans had to build a shelter, when the technology was not developed yet. He basically recreates this relationship buiding those igloos again, and underlying how we don’t have it anymore. Every igloo though has its own meaning, sometimes they have something written on them, and depending on the materials and the location, they can become something very different and particular. Here you have a picture of the sculpture again! He was the artist that made the Eating structure we showed before. How does it work? There are two blocks of marble kept together by a metal wire. But in the middle of them there is a salad head! I mean, a real one, an edible one. The salad will go rotten eventually, making the wire not sufficient to keep the two blocks together. The little one will then fall. BUT – and this is the genius – the museum, the collector, or whoever owns the work has to change the salad head every two or three days to avoid the block to fall, spending a fortune in salad heads (after having spent a fortune to buy the work itself). 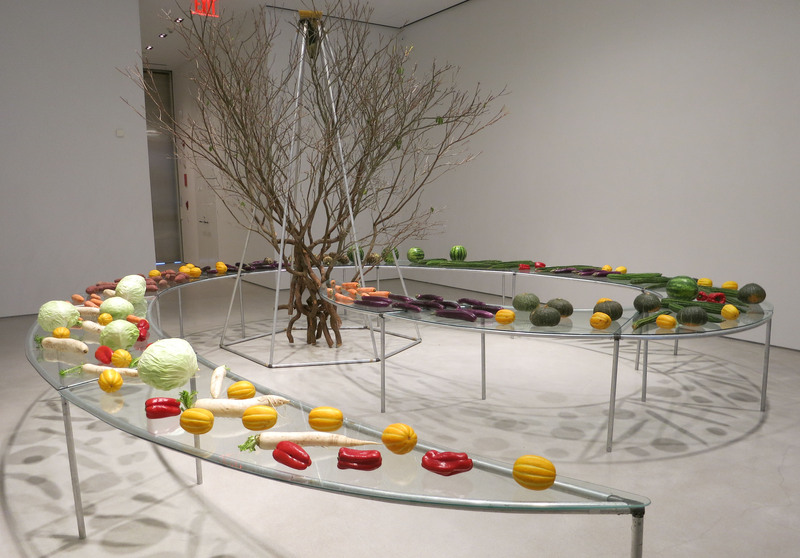 The sculpture is then “eating” the salad, because it needs it regularly to “survive”! Here is our Greek man! Jannis Kounellis brought the idea of “natural materials” to a whole next level: he used actual living beings as works of art. Yes, you understood exactly what it is: he took 12 real living horses to the Galleria l’Attico in Rome (it was changing its location, and Kounellis decided to use the old space in an… original way!) His statement was that nature itself is a work of art and makes works of art. Of course a work like this cannot be sold by its nature, so the attack to the art market actually worked. 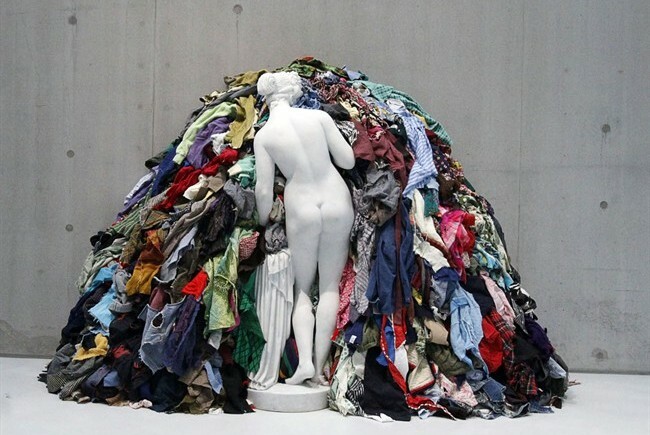 Michelangelo Pistoletto is very famous for many emblematic works, not necessarily connected to the movement of Arte Povera. One of his most known works though is belonging to the movement, and it is the Venus of the rags: the statue we see from behind is a copy of an ancient greek one, and it’s made of marble (so it’s now clear that we don’t see only poor materials!) and in front o her there is mountain of rags. These rags are recycled, used, abandoned. They are facing each other, the past and the present, the luxury of the past and the luxury of the present, the white and the colours… We could keep listing contrasts without an end. We have to mention Alighiero Boetti, because he is very famous around the world, even if mainly not for his contribution to the Arte Povera. In fact, he was one of the first ones to say goodbye to the movement very soon. Another artist that is very important is Giuseppe Penone: I didn’t include him in the main artists of the movement just because he started making art related to it very late in the 20th century: his first noticeable works (for our purposes) are from the ’70s and ’80s. 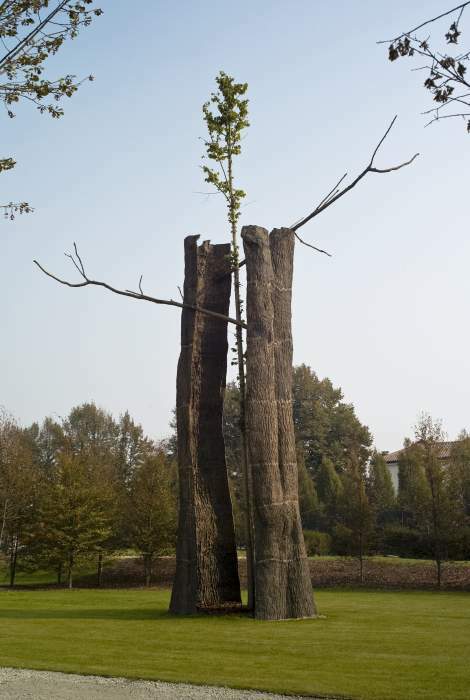 His works are mainly linked to trees and he works with them in many different ways: an example is the work that was exhibited in the Versailles Castle, called Tra scorza e scorza. The young tree inside was real, the outside was casted in bronze from an existing one. The casted one is protecting its baby from the dangers of outside, it’s making it grow peacefully, to avoid the same fate that was reserved to it months before. Moreover, a tree like that disturbes the perfect symmetries of the Versailles garden, making nature win again over the human order. Arte Povera had a lot of influence on the following artists, and Germano Celant’s manifesto is still very important for understanding the art of nowadays. The idea of going back to nature, back to the essential, back to the poor materials, is still very present in the art criticisms of today.